On Sale Now! Save 10% on the Dozydotes Child Recliner 4 Button Pecan Brown Leather DZD11527 by Dozydotes at Indsight. MPN: DZD11527. Hurry! Limited time offer. Offer valid only while supplies last. 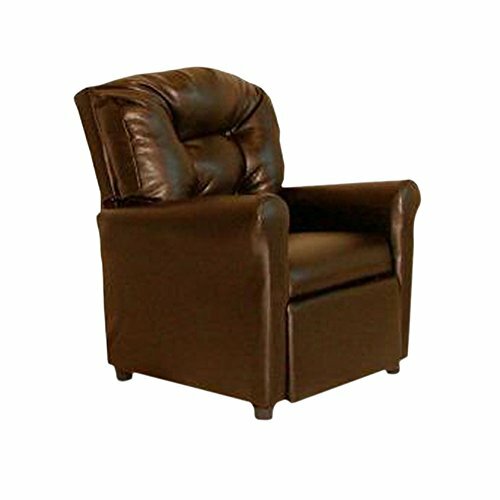 Upholstered in beautiful, stimulating fabric, the Pecan Brown Leather Like 4 Button Child Recliner Chair is sure to be a huge hit with your kids. Upholstered in beautiful, stimulating fabric, the Pecan Brown Leather Like 4 Button Child Recliner Chair is sure to be a huge hit with your kids. These are truly the most relaxing type of chairs they can possess. With welcoming back design and excellent support, it looks just great in any child's or family room. When your kids return from another long and exhausting day at school, they will be excited to see this comfortable, new, specially-sized recliner. Expect to enjoy the smiles. This vinyl fabric is easy to clean even on a muddy day. These are truly the most relaxing type of chairs they can possess.Weight limit: Up to 100 lbs. Dimensions: 27" high x 24" deep x 22" wide. Seat Height: 14" width 14" and depth 15". Recommended for ages 2 to 9. If you have any questions about this product by Dozydotes, contact us by completing and submitting the form below. If you are looking for a specif part number, please include it with your message.